Wolf Performance Ammunition (WPA) is a great choice for plinking and target shooting at the range. These new production 380 Auto rounds are loaded into cost effective berdan primed steel cases that are not re-loadable. Each projectile in this box of 50 is a 94 grain full metal jacket that is bi-metal and will attract a magnet. 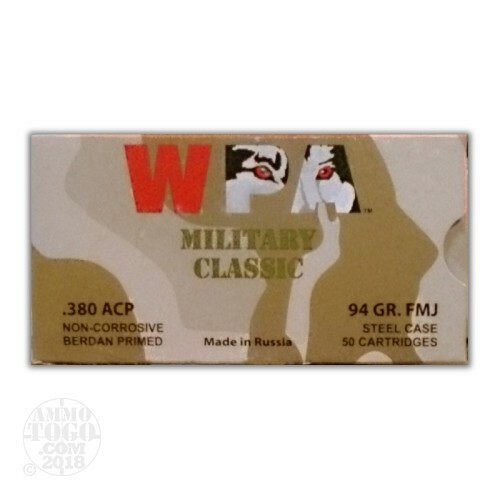 The Military Classic line from WPA is designed to be affordable without sacrificing reliability. Wolf Performance Ammunition is a trademark owned by Sporting Supplies International, who is a major importer of foreign ammunition. Most of the steel cases ammo with the Wolf name are manufactured in The Tula Cartridge Works facility located in Tula, Russia. Their ammo is both rugged and cost effective making it perfect for volume shooting at the range.